Busy days are good when they are productive days. Today was one of those days. Yesterday I asked you if you have ever had “one of those days”, well today was a complete opposite of that. I worked for a solid 6 hour block earlier in the day, then I spent an hour and a half on the phone with a client. Whenever we get on the phone we seem to talk for at least an hour, thank goodness he doesn’t bill me for his time, and vice-versa. Hmm. I guess it would be a trade off huh? It’s nice to talk to a client who knows what they want and are able to convey the details they are looking for in coherent sentences. What a refreshing experience. After we hung up the phone I worked for another hour before getting ready to take the two oldest kids to a camera club meeting. We’ve been meaning to attend for four months or so, and we actually made it tonight. In the past I have had scheduling conflicts and even forgotten which Thursday it was, but not this time. The kids had a great time and are eager to join the club and become part of the motley crew. During the drive home they were already talking about field trips, photo contests, and what treats to bring to the next meeting for the other members. You’ve got to love kids who look ahead. I’ve still got about 4 hours of work ahead of me before I call it a night, and tomorrow is going to be a wall-to-wall coding day as I work to complete the “project that crashed”. It looks like I’ll be working the weekend too to test code and make sure everything is ready for implementation on Monday. Funny thing about working for myself… I still haven’t figured out how to get out of work early without the boss finding out. 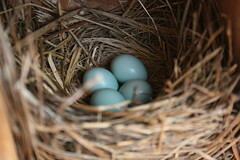 On a side note, the photo above shows the bluebird eggs currently in our bluebird house. It’s the second set of eggs, although we’re not entirely sure they came from the same parents as the last ones. I’ll be keeping my eye on them and maybe I’ll capture some really good newborn pics when the time comes.